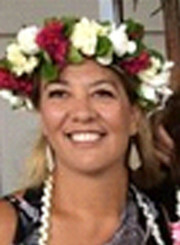 Ngaria has over 20 years’ teaching experience working with a cross section of primary school students in education in New Zealand. Ngaria recently worked in the Cook Islands for the Ministry of Education as an Inclusive Education Advisor providing professional development in Special Needs and Assistive Technology for Teachers and Principals. She has represented the Ministry of Education on the Children’s Rights Committee and Youth Suicide Prevention Committee. As an active member of the Cook Island Youth Suicide Committee, Ngaria was key in establishing the first 0800 Help Line phone service for youth to gain additional support for mental health care. Ngaria has daily interaction with children in the school environment and works closely with communities of parents and external agencies to create and implement the best educational health care for individual students who are at risk. She is culturally responsive and passionate about providing holistic care that meets the academic and personal needs of children. She has particular experience with supporting students and teachers in implementing individual education plans to support accelerated learning and healthy social emotional development. Ngaria has received training in Educational Law, Educational Finance Management, Specific Learning Disabilities, Team Leadership and Management and Assistive Technology. Ngaria’s approach embraces culture and identity first and foremost as a pathway to wellness and quality of life.